A trimotor is an aircraft powered by three engines and represents a compromise between complexity and safety and was often a result of the limited power of the engines available to the designer. Many trimotors were designed and built in the 1920s and 1930s, when engine power lagged behind the designers' power requirements. Dessau is a town and former municipality in Germany on the junction of the rivers Mulde and Elbe, in the Bundesland of Saxony-Anhalt. Since 1 July 2007, it has been part of the newly created municipality of Dessau-Roßlau. Population of Dessau proper: 77,973. 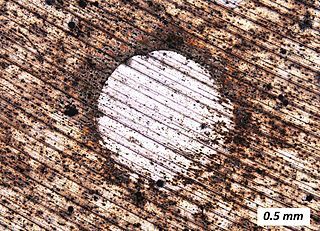 Duralumin is a trade name for one of the earliest types of age-hardenable aluminium alloys. Its use as a trade name is obsolete, and today the term mainly refers to aluminium–copper alloys, designated as the 2000 series by the International Alloy Designation System (IADS), as with 2014 and 2024 alloys used in airframe fabrication. The fuselage is an aircraft's main body section. It holds crew, passengers, and cargo. In single-engine aircraft it will usually contain an engine, as well, although in some amphibious aircraft the single engine is mounted on a pylon attached to the fuselage, which in turn is used as a floating hull. The fuselage also serves to position control and stabilization surfaces in specific relationships to lifting surfaces, which is required for aircraft stability and maneuverability. In a fixed-wing aircraft, the spar is often the main structural member of the wing, running spanwise at right angles to the fuselage. The spar carries flight loads and the weight of the wings while on the ground. Other structural and forming members such as ribs may be attached to the spar or spars, with stressed skin construction also sharing the loads where it is used. There may be more than one spar in a wing or none at all. However, where a single spar carries the majority of the forces on it, it is known as the main spar. An aileron is a hinged flight control surface usually forming part of the trailing edge of each wing of a fixed-wing aircraft. Ailerons are used in pairs to control the aircraft in roll, which normally results in a change in flight path due to the tilting of the lift vector. Movement around this axis is called 'rolling' or 'banking'. A tailplane, also known as a horizontal stabiliser, is a small lifting surface located on the tail (empennage) behind the main lifting surfaces of a fixed-wing aircraft as well as other non-fixed-wing aircraft such as helicopters and gyroplanes. Not all fixed-wing aircraft have tailplanes. Canards, tailless and flying wing aircraft have no separate tailplane, while in V-tail aircraft the vertical stabilizer, rudder, and the tail-plane and elevator are combined to form two diagonal surfaces in a V layout. Elevators are flight control surfaces, usually at the rear of an aircraft, which control the aircraft's pitch, and therefore the angle of attack and the lift of the wing. The elevators are usually hinged to the tailplane or horizontal stabilizer. They may be the only pitch control surface present, sometimes located at the front of the aircraft or integrated into a rear "all-moving tailplane" also called a slab elevator or stabilator. Landing gear is the undercarriage of an aircraft or spacecraft and may be used for either takeoff or landing. For aircraft it is generally both. It was also formerly called alighting gear by some manufacturers, such as the Glenn L. Martin Company. An aircraft fairing is a structure whose primary function is to produce a smooth outline and reduce drag. The BMW IV was a six-cylinder, water-cooled inline aircraft engine built in Germany in the 1920s. Power was in the 180 kW (250 hp) range. The IV was also produced under license by Junkers as the L2. A V12 engine is a V engine with 12 cylinders mounted on the crankcase in two banks of six cylinders each, usually but not always at a 60° angle to each other, with all 12 pistons driving a common crankshaft. Since each cylinder bank is essentially a straight-six which is by itself in both primary and secondary balance, a V12 inherits perfect primary and secondary balance no matter which V angle is used, and therefore it needs no balance shafts. A four-stroke 12 cylinder engine has an even firing order if cylinders fire every 60° of crankshaft rotation, so a V12 with cylinder banks at a multiples of 60° will have even firing intervals without using split crankpins. By using split crankpins or ignoring minor vibrations, any V angle is possible. The 180° configuration is usually referred to as a "flat-twelve engine" or a "boxer" although it is in reality a 180° V since the pistons can and normally do use shared crankpins. It may also be written as "V-12", although this is less common. A prototype is an early sample, model, or release of a product built to test a concept or process or to act as a thing to be replicated or learned from. It is a term used in a variety of contexts, including semantics, design, electronics, and software programming. A prototype is generally used to evaluate a new design to enhance precision by system analysts and users. Prototyping serves to provide specifications for a real, working system rather than a theoretical one. In some design workflow models, creating a prototype is the step between the formalization and the evaluation of an idea. The Ju 52 first was used in military service in the Spanish Civil War against the Spanish Republic. It was one of the first aircraft delivered to the faction of the army in revolt in July 1936, as both a bomber and transport. In the former role, it participated in the bombing of Guernica. No more of the bomber variants were built after this war, though it was again used as a bomber during the bombing of Warsaw  during the invasion of Poland in September 1939. The Luftwaffe then relied on the Ju 52 for transport roles during World War II, including paratroop drops. Hitler used a Deutsche Luft Hansa Ju 52 for campaigning in the 1932 German election, preferring flying to train travel. After he became Chancellor of Germany in 1933, Hans Baur became his personal pilot, and Hitler was provided with a personal Ju 52. Named Immelmann II after the World War I ace Max Immelmann, it carried the registration D-2600. As his power and importance grew, Hitler's personal air force grew to nearly 50 aircraft, based at Berlin Tempelhof Airport and made up mainly of Ju 52s, which also flew other members of his cabinet and war staff. In September 1939 at Baur's suggestion, Immelmann II was replaced by a four-engine Focke-Wulf Fw 200 Condor, although Immelman II remained his backup aircraft for the rest of World War II. Some military Ju 52s were converted to civilian use. For example, British European Airways operated 11 ex-Luftwaffe Ju 52/3mg8e machines, taken over by the RAF, between 1946 and retirement in 1947 on intra-U.K. routes before the Douglas DC-3 was introduced to the airline. French airlines such as Societe de Transports Aeriens (STA) and Air France flew Toucans in the late 1940s and early 1950s. 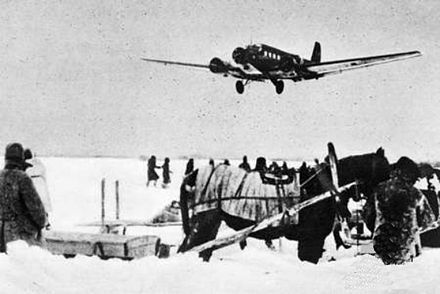 In the USSR, captured Ju 52s were allocated to the Civil Air Fleet, being found particularly suitable for transporting sulphur from the Karakum Desert. Various Soviet agencies used the Ju 52 through to 1950. A CASA-built Ju52/3m appears in the opening sequence and finale of the 1968 Richard Burton and Clint Eastwood film Where Eagles Dare . The Dornier Do 17, sometimes referred to as the Fliegender Bleistift, is a light bomber of Nazi Germany during World War II. It was produced by Claudius Dornier's company, Dornier Flugzeugwerke. The aircraft was designed as a Schnellbomber, a light bomber which, in theory, would be so fast that it could outrun defending fighter aircraft. The Junkers Ju 388Störtebeker is a World War II German Luftwaffe multi-role aircraft based on the Ju 88 airframe by way of the Ju 188. It differed from its predecessors in being intended for high altitude operation, with design features such as a pressurized cockpit for its crew. The Ju 388 was introduced very late in the war, and production problems along with the deteriorating war conditions meant that few were built. The Junkers Ju 188 was a German Luftwaffe high-performance medium bomber built during World War II, the planned follow-up to the Ju 88 with better performance and payload. It was produced only in limited numbers, due both to the presence of improved versions of the Ju 88, as well as the increasingly effective Allied strategic bombing campaign against German industry and the resulting focus on fighter production. The Heinkel He 70 is a mail plane and fast passenger aircraft of the 1930s designed by German aeronautics firm Heinkel Flugzeugwerke, which was also used in auxiliary bomber and aerial reconnaissance roles. It had a relatively brief commercial career before it was replaced by types which could carry more passengers. The He 70 was a leading design for its day, setting eight world speed records by the beginning of 1933. The Arado Ar 232Tausendfüßler, sometimes also called Tatzelwurm, was a cargo aircraft, designed and built in small numbers by the German firm Arado Flugzeugwerke during World War II. The design introduced, or brought together, almost all of the features now considered to be "standard" in modern cargo transport aircraft designs, including a box-like fuselage slung beneath a high wing; a rear loading ramp ; a high-mounted twin tail for easy access to the hold; and various features for operating from rough fields. Although the Luftwaffe was interested in replacing or supplementing its fleet of outdated Junkers Ju 52/3m transports, it had an abundance of types in production at the time, and did not purchase large numbers of the Ar 232. The Jumo 222 was a German high-power multiple-bank in-line piston aircraft engine from Junkers, designed under the management of Ferdinand Brandner of the Junkers Motorenwerke. The Hamburger Flugzeugbau Ha 137 was a German ground-attack aircraft of the 1930s. It was Blohm & Voss' entry into the contest to equip the re-forming Luftwaffe with its first purpose-built dive bomber. Although the contest would eventually be won by the Junkers Ju 87, the Ha 137 demonstrated that B&V's Hamburger Flugzeugbau, not even two years old at this point, had a truly capable design team of its own. One Ha 137 single-seat prototype competed against the Henschel Hs 123 at Rechlin. The Dornier Do 19 was a German four-engine heavy bomber that first flew on 28 October 1936. Only one prototype flew, and it was converted to a transport in 1938. The other two were scrapped. The Gotha Go 244 was a transport aircraft used by the Luftwaffe during World War II. The Junkers Ju 352 Herkules was a German World War II transport aircraft that was developed from the Junkers Ju 252. The Junkers Ju 252 was a German cargo aircraft that made its first flight in late October 1941. The aircraft was planned as a replacement for the Junkers Ju 52/3m in commercial airline service, but only a small number were built as cargo aircraft for the Luftwaffe. The Junkers Ju 488 was a proposed heavy strategic bomber, to be used by Nazi Germany in World War II but the project never got past the prototype, which was destroyed in a raid by the French Resistance. The Gotha Go 145 was a German World War II-era biplane of wood and fabric construction used by Luftwaffe training units. Although obsolete by the start of World War II, the Go 145 remained in operational service until the end of the War in Europe as a night harassment bomber. 1 2 Jackson 1960, p. 100. ↑ "'Bud' Johnston Library." Archived 14 November 2010 at the Wayback Machine Rolls-Royce of Canada Ltd., Montreal Quebec. ↑ "Flying Box Car for Sky Lanes Of Northland." Popular Mechanics, May 1939. ↑ "Junkers_Ju-52/1m ." Archived 29 September 2007 at the Wayback Machine scramble.nl. Retrieved: 12 October 2010. ↑ Green 1972, p. 405. ↑ Green 1972, p. 406. ↑ Green 1972, pp. 405–406. ↑ Smith and Kay 1972, p. 360. ↑ "Warsaw." Archived 27 June 2006 at the Wayback Machine richmond.edu. Retrieved: 12 October 2010. ↑ Morzik F. German Air force Airlift Operations. USAAF Historical division. 1961. P. 195. ↑ The Aeroplane Monthly, June 1994 p. 28. ↑ E.R Hooton, "Luftwaffe at War: Blitzkrieg in the West", 2007 Vol. 2, p. 50. ↑ Weal 2003, p. 91. ↑ Hoffmann 2000, p. 75. ↑ Afonso and Gomes 2000, pp. 178–183. ↑ airforce history "Ju-52." [ permanent dead link ]Swiss Air Force History. Retrieved: 12 October 2010. ↑ McPhee, John (7 November 1983). "La Place de la Concorde Suisse-II". The New Yorker. p. 55. Retrieved 22 July 2013. ↑ "Ju 52." Archived 5 April 2007 at the Wayback Machine Museum of Military Aviation. Retrieved: 12 October 2010. ↑ Duwelz, Yves. "Junkers Ju 52/3mge W Nr 5670 6309." Aviation Heritage in Belgium, October 2001. Retrieved: 4 April 2009. ↑ "Escuela Militar de Paracaidismo" (Military school of Parachuting) (in Spanish). Archived 25 December 2014 at the Wayback Machine ejercitodelaire.mde.es. Retrieved: 4 November 2010. ↑ Kulish, Nicholas. "Crowds Bid Fond Farewell to Airport That Saved Berlin." The New York Times, 30 October 2008. Retrieved: 4 April 2009. ↑ Kay, Anthony L. (2004). Junkers Aircraft & Engines 1913–1945. London: Putnam Aeronautical Books. ISBN 0 85177 985 9. ↑ Hagedorn, Dan (Fall 1992). "The Trek of the Aconcagua". AAHS Journal. Huntington Beach, CA: American Aviation Historical Society. 37 (3): 227. ↑ "Aviation Museum Dóbendorf" . Retrieved 25 June 2014. ↑ "Queen of the Skies". Deutsche Lufthansa Berlin-Stiftung. Retrieved 25 June 2014. ↑ "Archived copy". Archived from the original on 31 December 2015. Retrieved 3 February 2017. CS1 maint: Archived copy as title (link). Retrieved: 24 May 2011. ↑ "Ju 52/3m." Archived 8 November 2012 at the Wayback Machine Deutsches Technikmuseum. Retrieved: 12 October 2010. ↑ Archived 15 June 2011 at the Wayback Machine Technikmuseum Hugo Junkers Dessau. Retrieved: 22 June 2011. ↑ "Junkers Ju-52/3m g4e." Traditionsgemeinschaft Lufttransport Wunstorf . Retrieved: 12 October 2010. ↑ "Junkers Ju 52/3m " Archived 24 June 2015 at the Wayback Machine . Munich Airport. Retrieved 15 May 2015. ↑ Brea, Esteban (13 March 2012). "Museo Nacional de Aeronáutica: Más de medio siglo de preservación" [National Aeronautics Museum: More than half a century of preservation]. Gaceta Aeronautica (in Spanish). Retrieved 29 August 2015. ↑ Forsgren, Jan (2017). The Junkers Ju 52 Story. Fonthill Media. Retrieved 26 February 2019. ↑ "Junkers added to AMPAA collection". Aeroplane (August 2011): 12. ↑ "Ju 52." [ permanent dead link ]luftfahrt.museum.no. Retrieved: 12 October 2010. ↑ "List of aircraft displayed at the Norwegian Armed Forces Aircraft Collection." akersmus.no. Retrieved: 12 October 2010. ↑ "Junkers Ju52/3M (CASA 352L)." Archived 18 October 2016 at the Wayback Machine RAF Museum Cosford. Retrieved: 5 August 2018. ↑ "Junkers Ju52." Smithsonian National Air and Space Museum. Retrieved: 29 March 2015. ↑ "Junkers Ju 52." National Museum of the US Air Force. Retrieved: 29 August 2015. ↑ Jane 1946, pp. 170–171. Wikimedia Commons has media related to Junkers Ju 52 .